Poor old Humpty Dumpty has a fall and gets quite hurt. I wonder how that makes him feel? Maybe this nursery rhyme is a good opportunity to allow children some time to consider others and how they might feel in situations. To view the world through someone else’s eyes. There are differences between Empathy and Perspective taking. A child might see that Humpty Dumpty is sad and might want to help him feel happy again. But it is different to understanding why he is sad or hurting and then considering how that might feel to him as an individual. It is quite a complex concept for children to understand. It has been researched for some time and many studies show that children do not really start to show this level of cognitive development until around the age of 6 years. It is also true that some people never learn this skill. It is not something that just happens. This is why the experiences and conversations we have with children around feelings and the feelings of others, are so important. Although children do not start to show this level of understanding until around the age of 6, it is a lengthy process that does not really complete until around the age of 15. This is why guidance is needed and children need to be helped to “walk in someone else’s shoes” at times. To see beyond their own needs and feelings. With this in mind and the many pre-school aged squabbles that I seem to refereeing, I am always on the look out for new ways to help little ones consider the feelings of others around them and to understand that our actions can harm or help others. 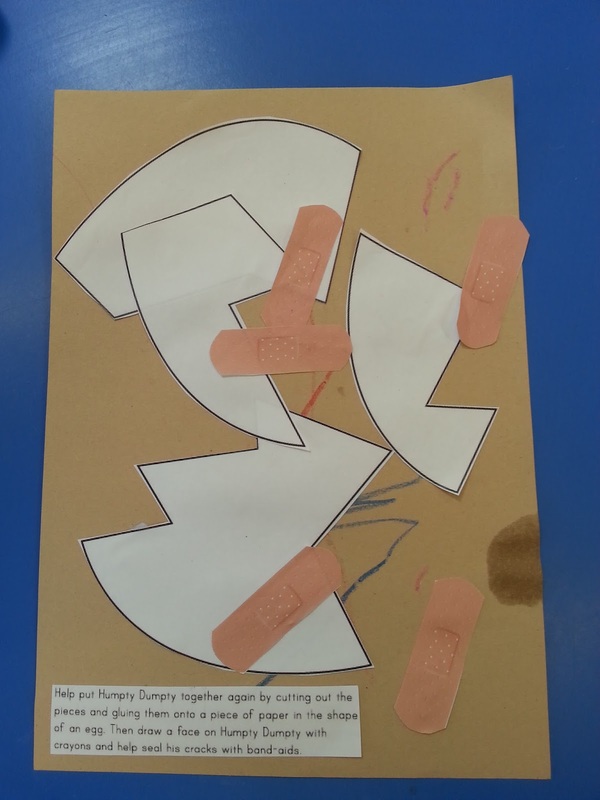 This activity was offered at a local play center and was linked to the afternoon nursery rhyme session. I thought it was a lovely idea and a simple way to introduce the concept of “other peoples feelings”. An egg shape cut in to several pieces. Match the shapes and number of pieces with your individual children;s abilities to match puzzles back together. A4 piece of coloured paper. Help the child to rebuild Humpty Dumpty. (The egg shape). Above are two examples. One was a 3 year olds work. She wanted the pieces to join. The second was that of a 20 month old. The learning for him was more about sticking the pieces on to the paper. As you help your children or support them in their activity ask them a few open questions. 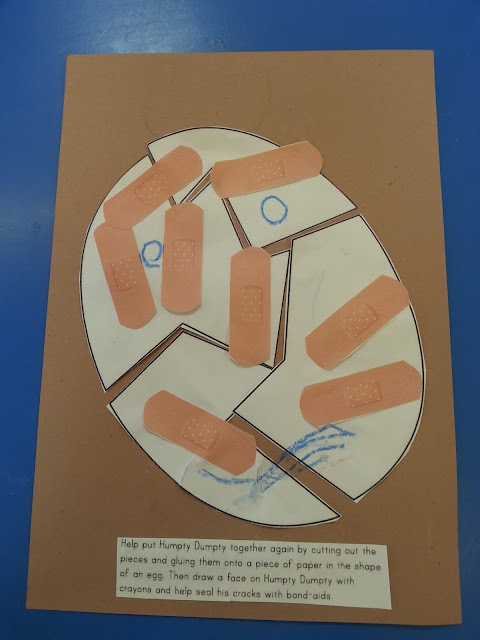 Use their own experiences and feelings as a spring board to explore the feelings of Humpty Dumpty. Have you ever fallen over and hurt yourself? Offer the plasters to the children and ask them if they would like to try and fix Humpty Dumpty. Did you put a plaster on your graze? Once you have explored the children’s memories of having had a fall, explore how they think Humpty might be feeling. Poor Humpty. I wonder how he must have felt when he fell off the wall. What do you think he wants us to do to help him? Can you think of things we could do to help him feel better? I wonder how he feels now that we have fixed him. Don’t forget to draw a face on Humpty. Maybe you could think about expressions and drawing a face that shows how he feels. This is just a starting point for a far more complex component of cognitive development but it does start to offer the children a different way of thinking.